Well, I guess this is my first post. I will say that I do add my input, however little it may be, to the past posts. Tonight we opened up a bottle from a recent Woodinville visit. Cam probably discussed several of these Puget Sound wineries in prior posts. This particular bottle is from Edmonds Winery. Going by the name Bentley, this table wine provides more bang for your buck than many red table wines from Washington. We opened up a bottle of Owen Roe table wine a few months and found it deplorable. (Disclaimer: I, unlike Camille and several other people discussing wine , will not hesitate from making my opinion known … even if it may not be shared by others.) Anyhow, Edmonds was about as intimate as a winery in an industrial area can be. Bentley, named after owner Doug Peterson’s dog (who is also present in the tasting room) is a rich, heavy, firm Merlot/Malbec blend. Primarily Merlot (82%), this 2007 vintage has a healthy nose, adequate amount of tannins, and strong fruit base. Some drawbacks include a limited finish, and rather weak body. However, for $22, this blend will definitely provide a hearty fill on a lazy night. Camille here… just wanted to put in a little detail that Jon left out. Edmonds is family owned and the owner and winemaker, Doug personally served us. He is great – you can see his passion when he talks about his wines. Bentley, the winery dog, is superfriendly and about as good a host as anyone could ask for. And I love the Bentley wine – it is full of structure without being too heavy and bold. Jon and I have been stuck at home, due to work and school schedules lately. It’s giving both of us the itch to do some traveling, but we had to make do with opening a nice bottle of wine to remember the trips we have taken. We decided to uncork a bottle of Peju Winery’s 2008 Napa Valley Sauvignon Blanc. We picked up this bottle on our July, 2010 trip to Napa Valley – our inaugural trip if you will, because we will definitely go back (totally random aside – Jon says saying “if you will”, sounds pretentious – I disagree. Feel free to comment). The weather was cool there while we were there, but it was nothing to complain about when you consider lows in the ’40s around here lately. I wrote about Peju in a previous post, but for a refresher, Peju was great once you get beyond the line to get into the tasting room, and the egos of some of the servers. Peju prides itself on its Chardonnay and Cabernet Sauvignon, but Jon and I thought the Sauvignon Blanc and the Zinfandel were their standouts. We paired it with some cheap Thai food meals-in-a-bowl. The meals in a bowl, frankly, sucked. We won’t go into anymore detail about those. The Sauvignon Blanc, on the other hand, was our own personal heaven for the day. The initial nose is of light butter, with a little bit of honeydew. The taste, was crisp and clean. The taste of melon and pineapple sweeten the wine’s acidity. Jon thinks that this wine drinks like a Washington Chardonnay, light butter and light oak. However we describe it, this wine completely made our day – the only drawback is that we only had one bottle. 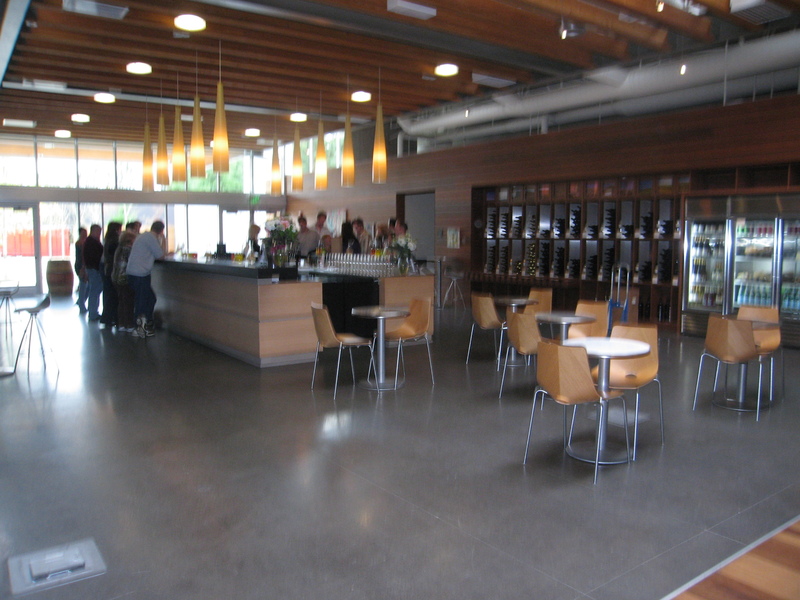 We took a day in September to drive down to the Woodinville winery area. It is a little out of our way, but hey, it was raining at home, so what better way to enjoy an afternoon when you have to be outside anyway? It poured on our drive, but by the time we ended up in Woodinville, it was a blustery, but not rainy, afternoon. We arrived a bit early, and a lot of the wineries don’t open until noon on Sunday, so our first stop ended up being a place that wasn’t on our list. Novelty Hill-Januik’s facility was very modern looking, with cement walls with wood accents. The interior is minimalist, and kind of cavernous, and reminded me of all the bachelor pads we see rich men on tv living in. There are actual two partner wineries here, Novelty Hill and Januik. Mike Januik makes the wine for both. You can choose different flights, $5 for their “Columbia Valley” tasting, or for $10 you can choose either their “King Cab” or reserve wine flight. When you choose a flight, then you get to choose four wines from the list to taste. I went with the $5 flight, and Jon chose the reserve flight – we frequently strategize this way, because most places don’t have a problem if you share. The first drawback was their tasting room servers were predominantely young, college age women who didn’t seem to know anything about the wine they were serving. I love getting the opinion of the server on what wines they like and how they describe the wine they pour. Our server didn’t have much to say at all, but she did have a beautiful blue topaz pendant and ring set. I digress. Anyway, back to the tasting. Here’s what we thought. Their wines were decent – not outstanding. The 2007 Novelty Hill Stillwater Creek Sauvignon Blanc was a good clean white. I really enjoyed it. Their Januik 2008 Chardonnay had an oakey nose, but was not all that oakey on the palate. It was a nice medium bodied crisp apple Chardonnay. Jon would have preferred something more buttery and oakey, but I liked it. The Januik 2009 Bacchus Riesling smelled crisp and had a lot of mineral smell. But I was disappointed with the taste; it tasted flat to me. It wasn’t overly sweet though like many Rieslings are. Of the reds, there were several that were very good, but I’m not sure it justifies the prices. Their Januik 2007 Champoux Cab Sauvignon had nice light oak and a good balance – we both really enjoyed this one, which is unusual for us to both like a Cab Sauvignon. The Januik 2006 Klipsun Merlot was a bold Merlot which Jon liked. He also liked the Januik 2007 Lewis Syrah – he liked it because it was not as jammy as many syrahs. The Novelty Hill 2006 Columbia Valley Syrah was more suited to Jon; he thought it was strong and bold with a lot of fruit and oak. I thought it would be better with a bit more of that jammy taste that Jon complains about. I guess to sum it up, the wine was good, but it had that big business wine feel. I would have preferred more of that small winery feel.